My campaign had finally reached the point where I was out of published adventures. The Twisted Halls had been explored, the Reavers of Harkenwold were defeated, and the Winter King had been slain in his Cairn. So the question was: now what? I was nervous about going purely from scratch due to my inexperience. My players needed closure to the matter of Traevus and the mysterious skull, which had been dangling in front of them since the Red Box adventure. So I decided to heavily modify an adventure from DDI’s Dungeon magazine, The Dungeon of the Ghost Tower. Traevus and his backstory are important plot points in the adventure, so it was a good fit. Since it was intended for level 2 PCs, and the group was level 5, I knew there was some serious work to be done. This was a good opportunity for me to try balancing my own encounters, while not having to create the plot and maps out of whole cloth. Here’s what I learned from the experience. Looking for cheap minis in my local gaming store’s $1 bin, I found a set of 6 Wrackspawn. 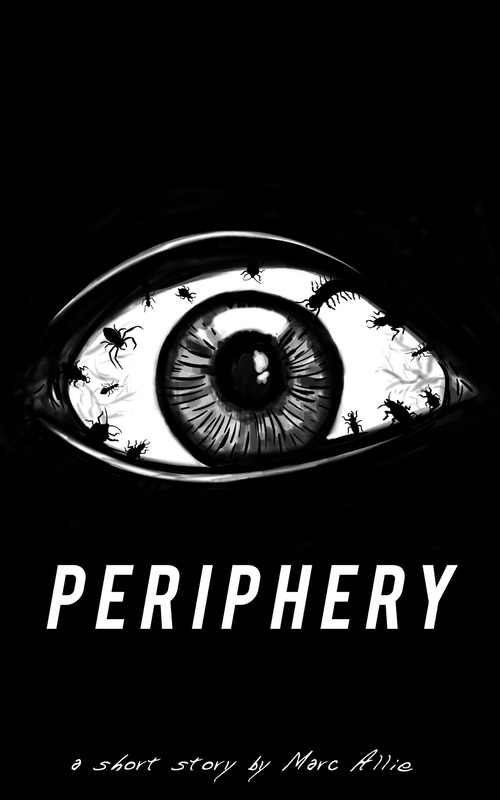 They looked sufficiently creepy to pass as the aberrant remnants of Anarus Kalton’s dark experiments. But the stats for Wrackspawn in the Monster Builder weren’t perfect. Rather than significantly adjust the level, I simply chose another monster and customized its flavor. 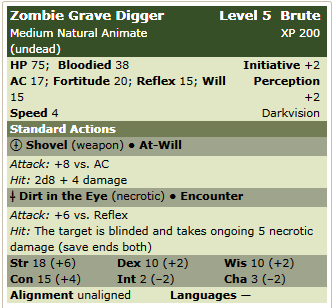 The model for my Wrackspawn was the Zombie Gravedigger. The shovel became a bone spear, to match the miniature. I liked the effect of Dirt in the Eye, but it didn’t fit the theme. Vomiting blood certainly fit the bill. I didn’t alter the stats at all, just the flavor, and it turned out just fine. Zombies and wrackspawn are similar mechanically, anyway, so a couple tweaks was enough to fit the bill. But serious reskinning can be done on the fly, too; at one point in the adventure, my players didn’t solve a puzzle correctly. Having neglected to plan for this, I panicked for a moment, then grabbed the Monster Vault book and found the Gnoll Gorger, who was close in level but way off for flavor. The Gorger was reskinned as a Blood Elemental, since blood had been a big part of the setting of the dungeon. It sounds like a stretch, but all you really need is a base set of stats in instances like this; most powers and abilities can be either changed or ignored. I refluffed the Gorge power to be the Elemental healing itself as it drew blood from the heroes’ wounds. My players were none the wiser. Reskinning monsters is a key skill for any DM, but particularly for those who are more extemporaneous in their storytelling, or those who don’t always have time to prepare (which I am sure is most of us). I’ve discussed props before, but for this adventure, I really wanted something special, and the magical portal prop from Sly Flourish’s excellent blogwas perfect for my needs. One of the most important parts of the dungeon was the magical purple cloud that could only be passed by obtaining the four parts to the key. I decided a whirling, rainbow-hued portal with flashes of lightning was more interesting. I ordered rainbow tea lights from Amazon, and added on a standard set to use for torchlights throughout the dungeon. Instead of a vase, I used a hard-plastic Dragon Shield brand deck box I had lying around. I had lots of trouble finding Halloween spiderwebs and the flashing strobe lights, though. A trip to Party City turned up a decent alternative to the latter: a couple “flashing teeth” gag gifts. The best I could find for the webs was polyfill batting used for quilting, available at most craft stores. It took some doing, but the end product was really cool. Thanks, Mike Shea, for the inspiration. When it came time to reveal the portal, I asked my players to leave the room. I dimmed all of the lights, placed the portal and a few tea lights on the map and across the table, and cued up some suitably eerie music. They were eager to see what was in store, but I had them close their eyes and I described the sounds and smells of the crypt, then I let them come back to the table. Immediately, I could tell that all my efforts were worth it; the players knew that this place was special and important. For this encounter, I used two gargoyles and large group of decaying skeleton minions. The gargoyles were a bit of a conundrum to my players, so I decided on the spot to throw more minions at them to increase the tension. Static bursts of lightning skittered out of the portal, and more new skeletons rose when the bursts passed over them (1d3 each round). The minions were hardly a threat, but did serve to add a sense of urgency to the encounter. 3D map elements, like terrain from Heroscape (as pictured above) or even simple wooden blocks, are another way to spice up your battles. 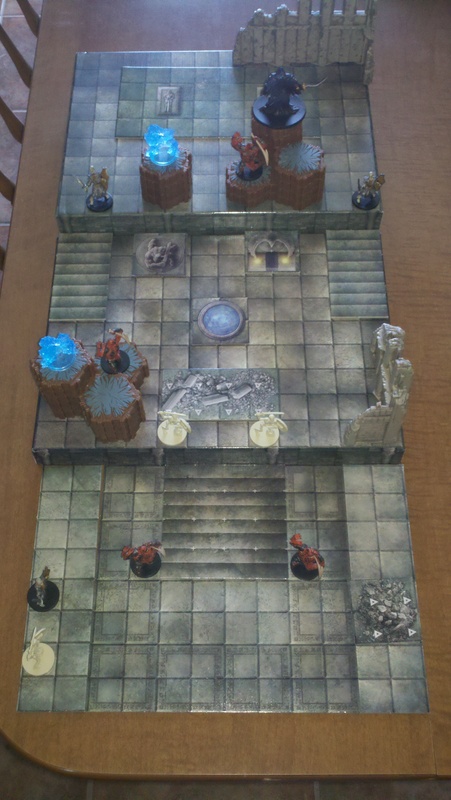 The Dungeon Tiles Master Set box can be used as terrain, and it’s simple enough to tape down stair tiles to connect the levels. I had some Heroscape terrain laying around, and even though it is a hex based system, I decided to use it anyway. When Anarus raised the platforms in the second round of the final battle, it was another epic moment. It added interesting situations to the battle, as well. Our paladin, passing an Athletics check, knocked over a platform, damaging the undead as it fell. Anytime you can spice combat up, it’s a good thing. I was extremely pleased with the way the magical portal and 3D terrain props turned out; both really added to the game experience. My players raved about how cool the session was. Obviously, you won’t have magical portals or rising platforms in every session. But, since this was the culmination of six levels worth of storyline, I felt like going above and beyond seemed like a good idea. Good DMs should look for ways to make important encounters unique, and interesting tabletop props are one way to do that.